Being a tech enthusiast has a lot of pros, but for me, there has always been one con — schlepping around all those mobile devices. I love the gear, but I just hate the clutter. Smartphones, digital cameras, tablets and laptops are pretty much the basics, but sizing all that up against my skinny purse is a losing proposition. Out comes the roomy go-bag, and the horrifying clunkety clunk of these gadgets knocking together in there. Then there’s the issue of syncing or sharing data across all those devices. Oy. There has to be a better way. In fact, there has been so much talk of convergence, you’ve got to wonder if there isn’t something to unite these gadgets. 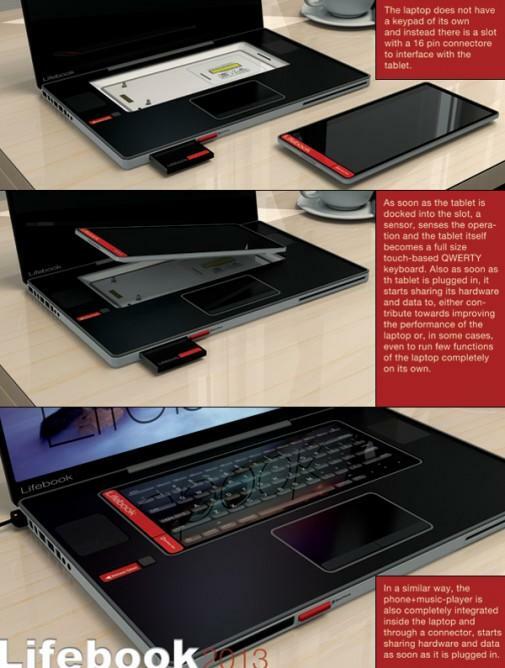 They could even be like attachable/detachable components of a larger system — perhaps a little something like this Fujitsu Lifebook concept. Now that’s what I’m talking about. It always seem kind of redundant to have an awesome camera in one hand, while your computer packed in yet another (likely less powerful one). And what if you could combine the sheer computing power of all your gadgets into one supercomputing device? 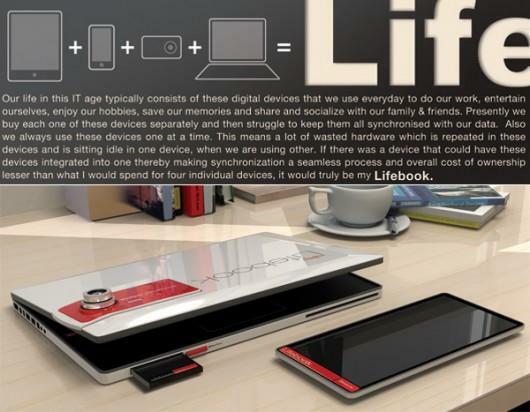 That’s what the “Lifebook 2013” concept addresses. Created by Prashant Chandra as part of a Fujitsu design competition, this idea features slots and spaces where a camera, smartphone and tablet could slide right in. Not that it’s perfect: First, as a consumer, you’d basically be buying into an entire eco-system put out by one manufacturer, which can be a pro or a con, depending on your point of view. Second, the capacitive tablet screen might be okay for short-form messages, but who’d want to have that as their main input? Well, there’s always version 2.0, which will hopefully use the tablet as a touch-enabled display instead of the keyboard. Still, I like where this is going, and fervently hope that tech makers will develop novel ideas like this in the future. For more amazing concepts from this competition, click here. 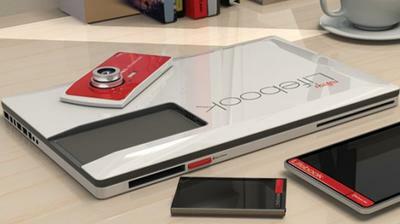 Could you see yourself rocking an all-in-one mobile computing component system like this? Or do you prefer to keep your gadgets separate and independent?